These sandals are absolutely wondrous. Don't they just remind you of a palace? If there was a palace decorated from floor to ceiling with shoes, you would find these on one of the racks. I'm sure of it. 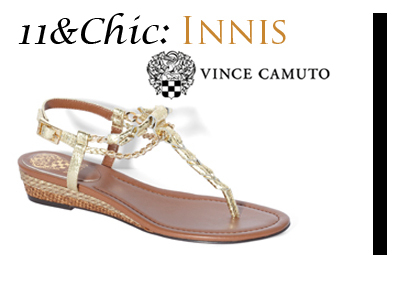 "Innis" by Vince Camuto has strapping that has a mix of metal and leather. It has a bit of a wedge to make it more comfortable to walk in, it's description says. So much detailing, so much chicness is going on with this shoe, and most importantly it's available in size 11.